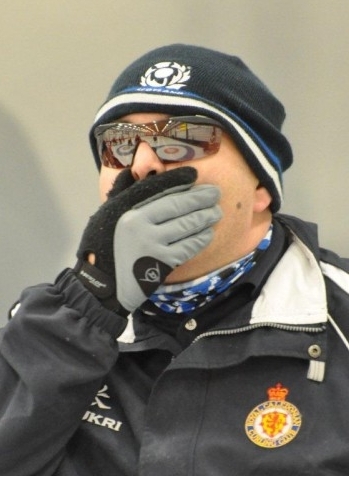 Benoit Lessard brought his Magog CC team to the Victoria CC in Quebec City this weekend to compete in a best of 5 Provincial Championship series against a home side skipped by Jean-François Sylvestre. He added Sébastien Boisvert to last year's team in place of Denis Grenier, who is now alternate. C’est en fin de semaine que se déroulait dans la ville de Québec le championnat provincial, où Équipe Lessard rencontrait Équipe Sylvestre dans un trois de cinq afin de déterminer l’équipe représentante en vue des championnats canadiens. Cette année Benoit Lessard ajoutait à son équipe un nouveau venu comme deuxième soit Sébastien Boisvert qui a prouvé hors de tout doute ses capacités à joindre l’équipe, Denis Grenier devenant le cinquième joueur. Lessard had beaten Sylvestre comfortably last year, and quickly established a 7-1 lead at the break in the first game. Sylvestre fought back, taking 2 in the 5th and then posting steals in each of the final 3 ends, but falling just a point short in the 7-6 final score. L’année dernière l’Équipe Lessard avait nettement dominé le tournoi provincial contre l’Équipe Sylvestre. En fin de semaine L’Équipe Sylvestre a su répliquer à l’offensive menée par Lessard, en volant un point aux trois derniers bouts et terminer la première ronde avec un pointage de 7-6 en faveur de Lessard. In the second game, Lessard led 9-1 after 5 and finished more convincingly to win 10-3. 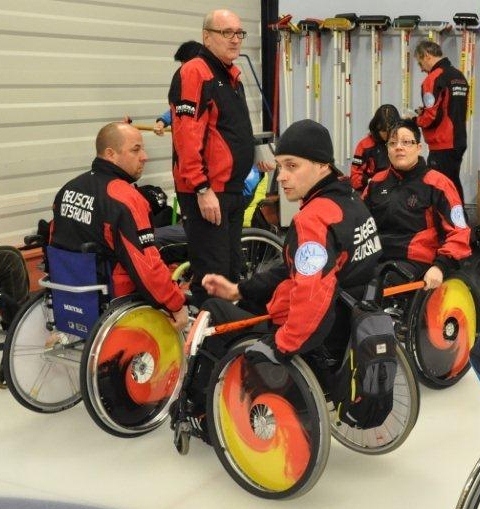 En deuxième ronde, l’Équipe Lessard a mené définitivement la partie en menant 9-1 jusqu’au 5ème bout, pour terminer avec une confortable avance de 10-3. Lessard started Sunday's game 3 with a two with hammer, then gave up a 3, scored another two with hammer and the stole 4 on the way to a third and decisive victory 9-6. Dimanche matin, l’Équipe Lessard amorçait la partie avec 2 points et en possession du marteau, puis en perdait trois contre Sylvestre. Encore en possession du marteau Lessard en remettait avec un autre 2 points puis assommait l’équipe adverse avec un vol de 4 points terminant ainsi la partie avec un pointage de 9-6 sur Sylvestre terminant ainsi la série en trois victoires consécutives. Line scores are available at a link on this page. Pointage accessible sur ce lien. 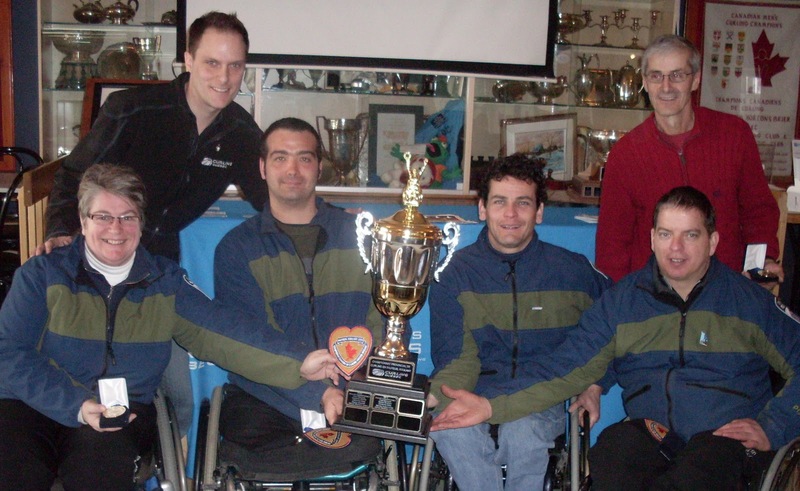 Team Lessard will represent Quebec at the Nationals in Edmonton March 20-27. Équipe Lessard pour une troisième année consécutive, représentera le Québec lors des championnats canadiens à Edmonton du 20 au 27 mars prochain. 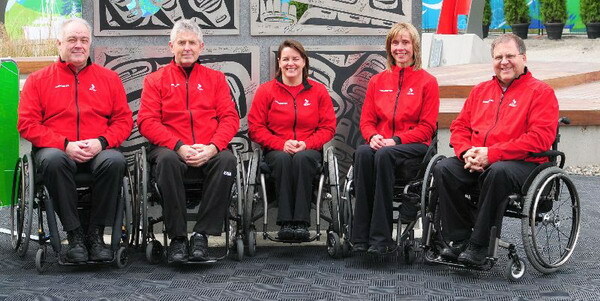 Canada completed their sweep of the round robin matches at the 7th World Wheelchair Curling Championships in Prague, beating Scotland 9-4 in the final draw. Skip Jim Armstrong, acknowledging tight early results, told reporters that his team had not played together very often this year and had taken a little while to settle in and get used to the ice, but were feeling increasingly comfortable as the week went on. 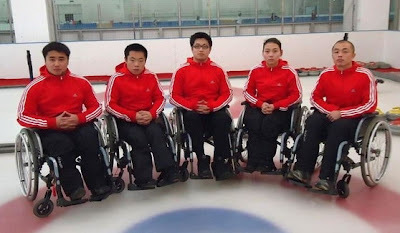 It was Canada's steal of 3 in the 4th end that put paid to Scotland's hopes of appearing in the 1-2 playoff game, given that they lost to China 5-4 in an extra end this morning. China held their fate in their own hands when they faced fellow qualifiers Russia, who beat Sweden 8-3 this morning, in the final draw. The winner would play on, the loser would have to wait for next year. Norway went into today's games knowing they had at least a tie-break. 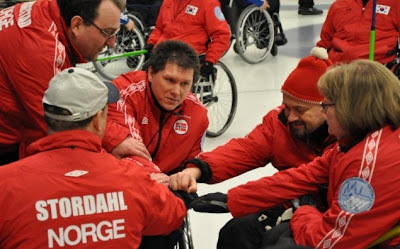 Coach Thoralf Hognestad was philosophical about his team's defeats by Canada and Scotland, but unhappy at the loss to the struggling Czechs, a game where he felt his team blew more than enough chances to win. They almost blew their game against bottom team Germany, needing an extra end to post a 7-6 victory after giving up a steal in the 8th. German coach Helmar Erlewein, acknowledging a new line-up, had limited ambitions for this Championship; a desire to qualify for next year. In the final draw his team avoided automatic relegation by defeating Sweden 7-3. USA, who began the competition with definite plans on a medal, had only the morning game, a vital third victory, 9-3 over the host Czechs. They then had an anxious wait to see whether the afternoon results would go their way. They did, with the Czechs losing to Korea 7-3 and Sweden's loss to Germany. 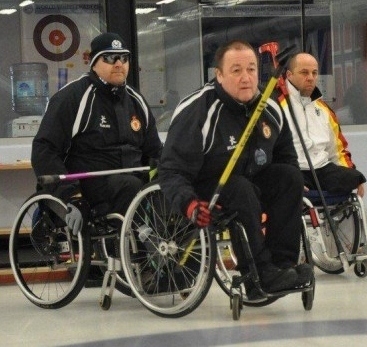 This put Germany, Sweden and the Czech Republic all at 2-7 with a series of playoff games to come to decide which two teams will be relegated to the Qualifying Tournament in Finland next November. Canada plays Norway in the 1 vs 2 game tomorrow. 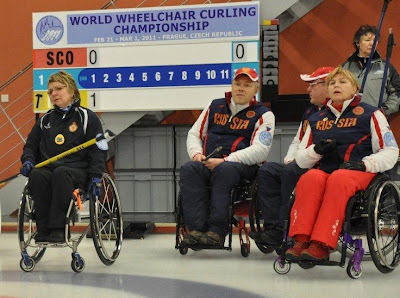 The winner goes to the final, the loser plays the winner of the 3 vs 4 game between Russia and Scotland. Russia beat Scotland 7-3 on the opening day. 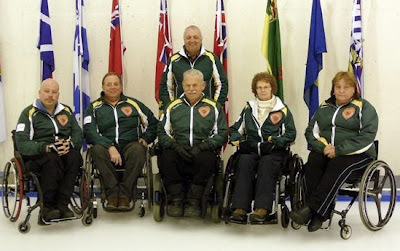 Wayne Ficek's Kenora/Sudbury squad won their third consecutive provincial title when they beat Sudbury newcomers Steve Daniel's newcomers 5-4 in the final of the Shoppers Home Health Care NOCA Wheelchair Provincial Championships at the Fort William CC. Team Ficek will now represent Northern Ontario at the TMX Canadian Nationals in Edmonton March 20-27. 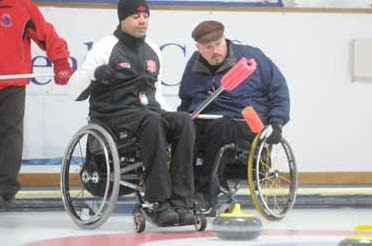 Defending champions Team Ficek of Kenora/Dryden went undefeated during round robin play and by rule will have two opportunities to add a third consecutive Northern Ontario title when they face Sudbury rookies Team Daniel in the final of the Shoppers Home Health Care NOCA Wheelchair Provincial Championships at the Fort William CC on Sunday Feb 27. Ficek posted their third round robin win, over Sonego 11-4, on the strength of consecutive 4s either side of the break. Steve Daniel's Sudbury team beat home side Levesque 10-9. They opened with a 4 but gave up 3 in the 8th and needed a single in the extra end to force a series of tie-breaks to decide who played Fiek in the final. In the first tie-break game Daniel again went to an extra end against Sonego, this time stealing 2 to win 8-6. Daniel then played Levesque for the second time today, taking a 7-1 lead into the break. Levesque took two in the 5th end and stole 3 more to pull within one with an end to go, but Daniel claimed his place in the final with a single point in the 8th and an 8-6 win. Game 1 of the final starts 10.30AM local time, and Ficek will clam the title if his team wins. If they lose, there will be a rematch at 2.30PM with the winner of that game going on to Edmonton Nationals in March. Line scores are HERE. Despite detailed instructions I haven't been able to find the UStream video coverage from the club. Your luck may be better than mine. Check the Fort William CC website for details. 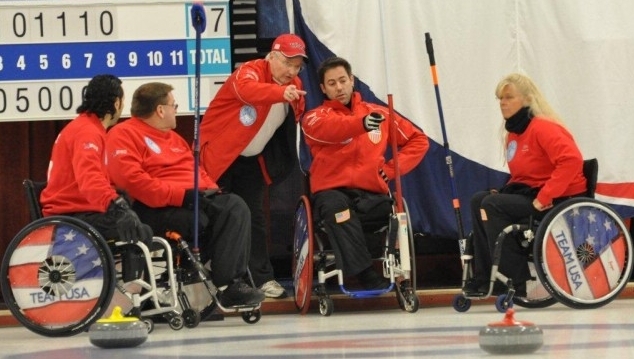 Worlds Day 5 - Unbeaten Canada clinch playoff spot. Alberta's patient alternate Bruno Yizek was given a game at 2nd against Germany (1-6) in the morning draw that saw Canada (8-0) coast to a 13-0 win in six ends. The opposition promised to be tougher in the afternoon, but Canada stole an early 4-0 lead over Norway (5-3) on their way to a 7-4 win that guaranteed them a place in the Page 1 vs 2 playoff game. Norway had lost to the Czech Republic in the morning draw, again by falling behind early. 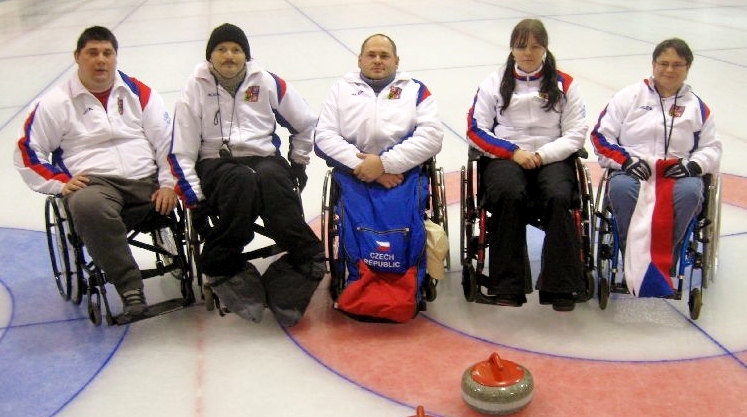 Though they tied the game after 6 ends, and were just one down with hammer in the 8th, they were unable to deny the Czechs their second win, losing 6-4. Norwegian skip Rune Lorentsen remained upbeat saying “with two beginners and our third player who has never been in the Worlds before, our performance this week is above all our expectations.” They face last place Germany tomorrow, and with the other 3 loss teams playing each other, are guaranteed a playoff spot with a win. Scotland (6-1) clinched their playoff spot with a 5-4 win over Korea (3-5). “When you come to the world championships your first goal is to get the business end of the week,” said skip Aileen Neilson. “[then) we take stock and focus and start the competition again.” Three losses guarantees a playoff spot. China (4-3) beat Sweden (2-5) 5-3 in their only game today, but have a tough finish against Scotland and Russia tomorrow. 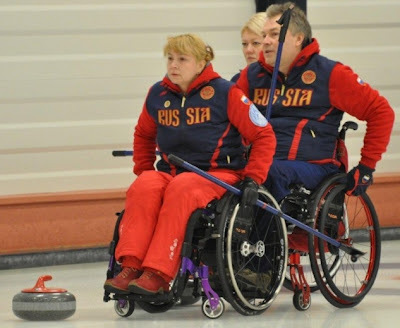 Russia needed a steal of 2 in an extra end to put away the disappointing Americans who again dug themselves a huge hole by giving up a big end, this time a five before the break, that single point steals were unable to overcome. 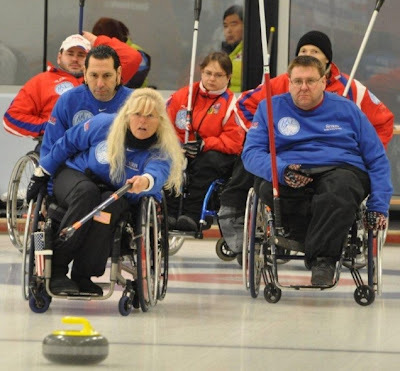 USA had posted a decisive 12-3 win to dent Korea's playoff hopes in the morning draw but relegation to the Qulifying Tournament is now a very real possibility for a USA team who had made the playoffs at the 2009 Worlds and 2010 Paralympics. They play the Czechs tomorrow in a must win game for both teams. 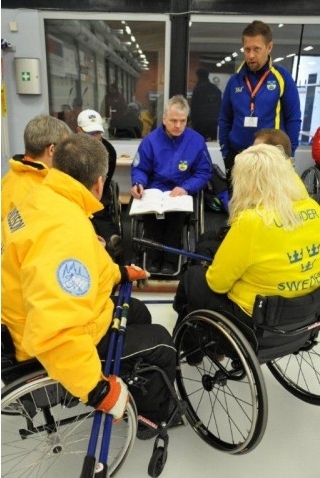 Another team who will be fighting for survival are Paralympic bronze medallists Sweden who play Russia tomorrow. Both teams will be highly motivated; for opposite reasons. Canada plays Scotland tomorrow. 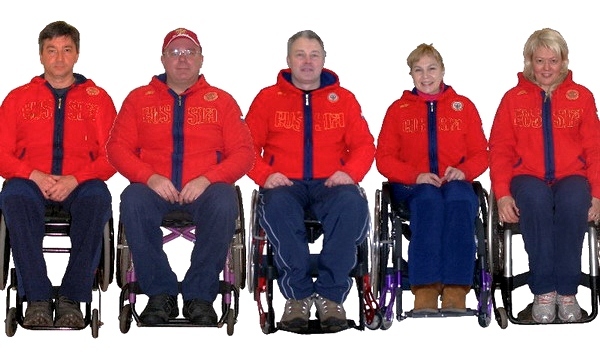 You can see the full schedule, results and tables in our Worlds 2011 section of the wheelchaircurling.com website. 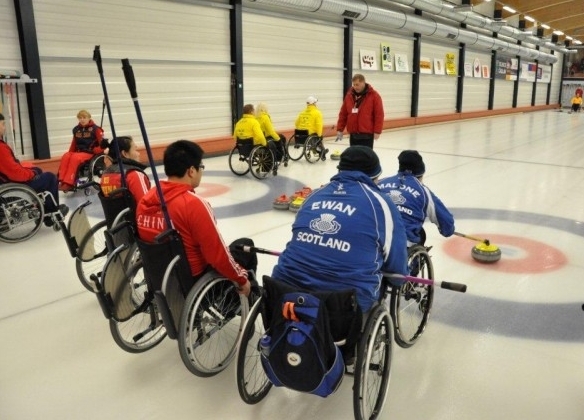 Norway's run of 22 games without defeat came to a decisive halt when they faced Scotland in Draw 7 of the World Championships in Prague. 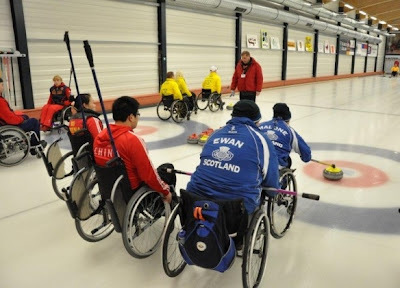 The game went with hammer, with Scotland holding a 3-1 edge at the break, before the Scots posted steals of 3 in the 5th and 6th before early handshakes and a 9-1 win. The win put Scotland in a tie with Norway for second place and skip Aileen Nielson was delighted to have broken Norway's streak. "My team played a phenomenal game. But we need to keep our heads screwed on because we’ve still got three more games to go.” Scotland had beaten Germany 10-4 earlier in the day but still have to face Korea, China and Canada. Canada had a very tough 5-4 win over the Czech Republic to maintain their unbeaten record and claim sole ownership of the top of the table. The Czechs went out to an early 3-0 lead before seeing it slip away in a series of single point steals. 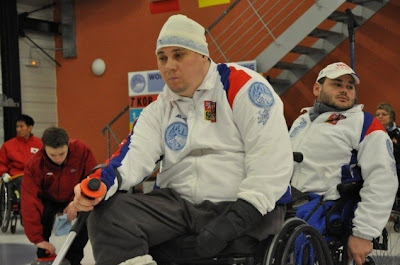 Skip Radek Pokorný said his team had tried hard to surprise Canada and thought they did that, managing to force Canada into some difficult situations. Korea kept their playoff hopes alive with an 8-2 win on four consecutive steals over fellow challengers Russia, though Russia regrouped to post a 14-0 win over an emotionally drained Czech Republic. China handed Germany their second loss of the day, and kept their playoff hopes on track with the 11-1 win. They are tied with Korea and Russia for fourth place. 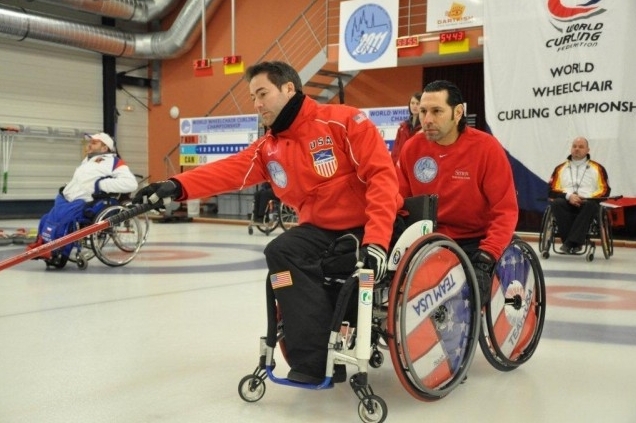 Sweden won their second game and put paid to USA's medal chances with a 9-6 win. 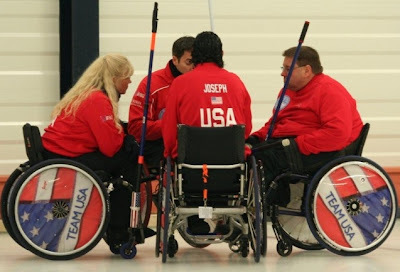 USA have lost some very close games this week, but in a game they had to win they were down 5-0 after two ends despite having hammer. They pulled back to level the scores and started the 7th with hammer but gave up 3 and lost 9-6. Canada plays Germany and Norway tomorrow. You can see the full schedule, results and tables in our Worlds 2011 section of the wheelchaircurling.com website. Weekly Poll #8 - Should the Nationals charge for admission? This week's poll asks whether there should be an admission charge at the National Wheelchair Curling Championships. Last year Kelowna decided not to charge because they wanted to encourage people to watch the event and spread the word. 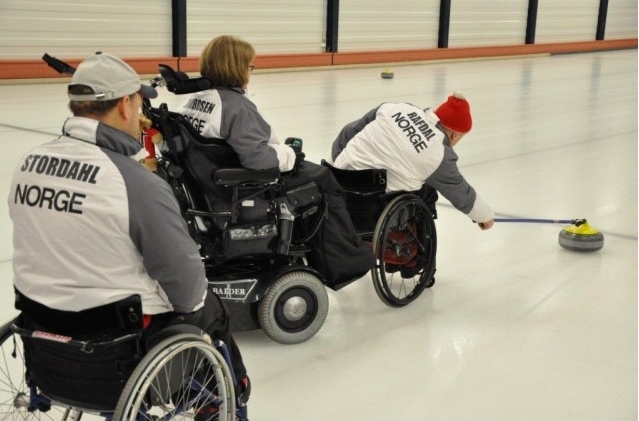 So this week's question - should spectators be charged to watch the National Wheelchair Curling Championships? Press the button on the right margin of the blog, that corresponds to your answer. If you have an opinion on the Edmonton policy, share it in the comments below. In last week's poll, 84% of voters felt that Canada would make the podium, 46% picked USA, 37% chose China and Korea, 28% chose Norway (smart people) and 18% picked Sweden. None of the others reached 10%. The Shoppers Home Health Care NOCA Wheelchair Provincial Championships begin Friday February 25th 1030AM at the Fort William CC in Thunder Bay. 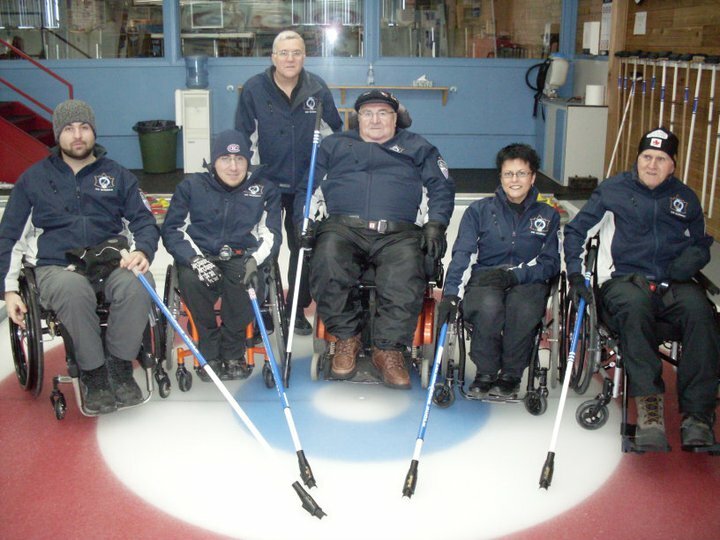 Defending champion Team Ficek, out of Kenora and Dryden, are hoping for a third consecutive appearance at the Nationals in Edmonton in March. He admitted his team underperformed last year, going 3-6 after making it to a playoff tie-break game the year before. This year, after a couple of warm-up wins over Manitoba, he says his team is raring to go. To win he will have to get past home club Team Levesque, coached by Dave Kawahara who was instrumental in bringing wheelchair curling to Northern Ontario. Carl Levesque skipped the first provincial team, which included Wayne Ficek and Mark Wherrett, now his competitors. Fort William CC is also fielding a team skipped by Gino Sonego. 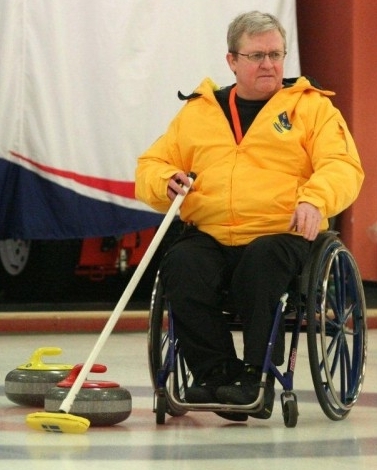 Sudbury joins the oarty this year, sending a team of rookie curlers but experienced athletes skipped by Steve Daniel. 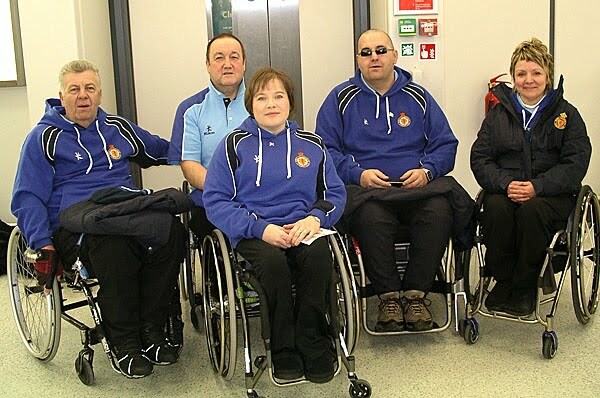 Tournament format is a round robin with the top two teams playing in the final, 10.30AM Sunday February 27. 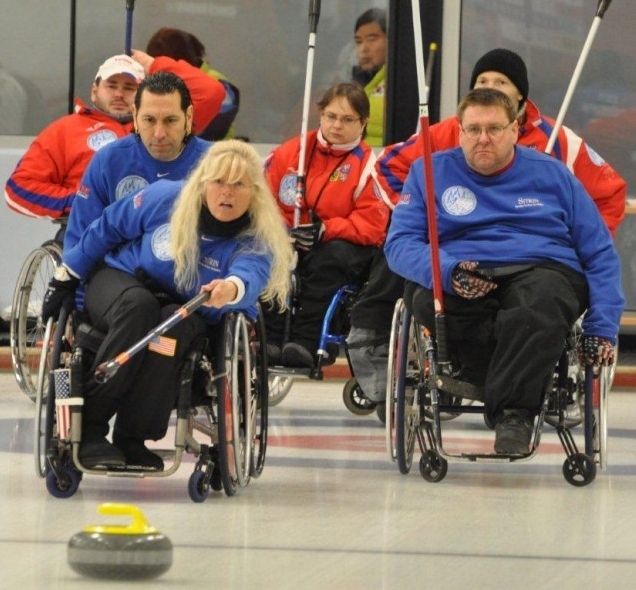 Norway won their twentieth consecutive match this morning, beating Russia 7-3. "This afternoon," promised coach Thoralf Hognestad, "we will play tennis!" 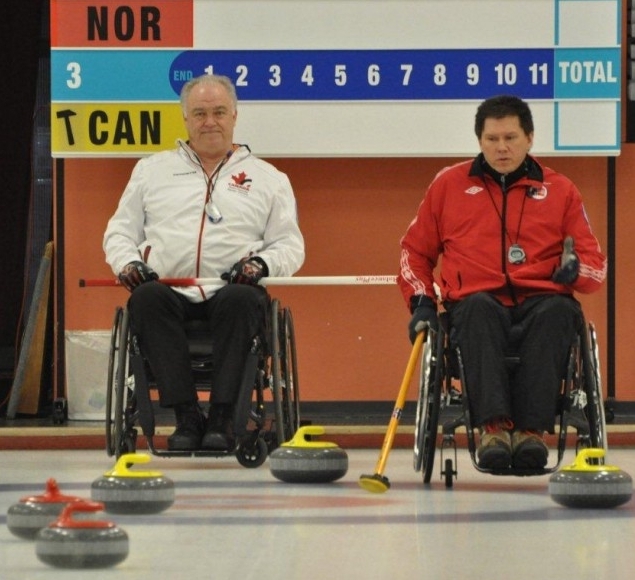 Canada continued their run of nail-biting single point victories with a 6-5 win over Korea. They were behind 3-2 at the 4th end break, and gave up a steal in the 5th, but then scored the next four points. Korean skip Tae Yeong Jeong, needing two to force an extra, was light on his final draw and managed only a single. Scotland regrouped from yesterday's disappointing loss to Russia to post two wins, 10-2 over the Czechs and 7-4 over Sweden. “Sometimes it’s that last stone that makes the difference,” said Scottish Skip Aileen Neilson, who ended Sweden’s chances of tying up the game in the eighth end with her last stone. “Sometimes you just do the maths and I thought if I get rid of that stone he [Swedish Skip Glenn Ikonen] is not going to get his two. That was the objective and it came off.” Not only was the takeout successful, it padded the score with a steal. USA finally entered the win column, scoring 4 in the 7th to sink Germany 9-3. “I think the difference between yesterday and today is that we shot to make the shots and yesterday sometimes we felt that we were shooting not to miss. The key shots we needed to make today – we did!” exclaimed US Skip Augusto Perez. 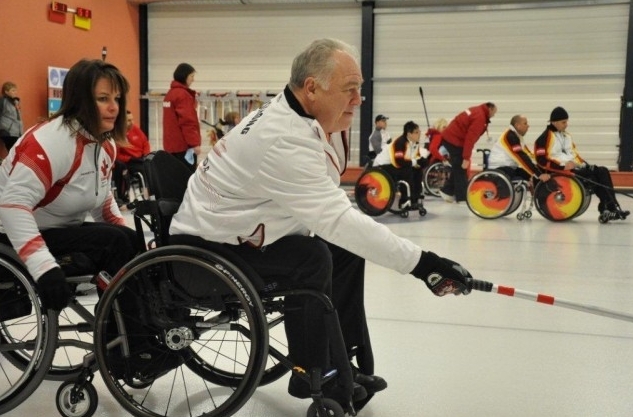 Germany mounted a comeback against Russia in the afternoon after giving up a 4 in the 6th. They stole 2 in the 8th to force an extra end, but it wasn't enough as Russia took their one to win 8-7 and leave Germany as the only team without a win. Hosts Czech Republic won their first game, a convincing 9-3 defeat of China in a game where they stole points in 5 of the 7 ends. Canada play Russia and Sweden tomorrow. 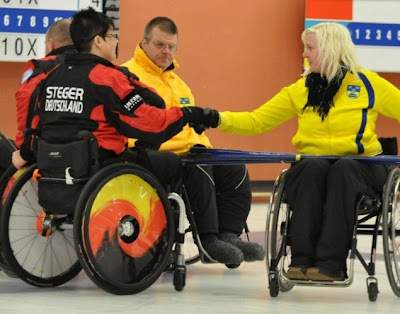 You can see the full schedule, results and tables in our Worlds 2011 section of the wheelchaircurling.com website. Chuncheon City, in South Korea will host the 2012 World Wheelchair Curling Championship. 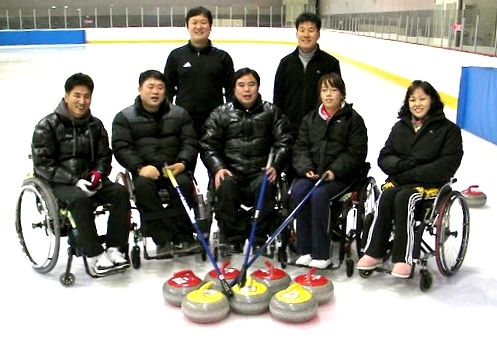 The event will be held in the Uiam Ice Rink, Chuncheon City, Gangwon Province between 18-25 February 2012. 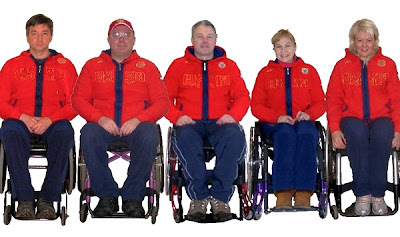 The World Championship Qualifying tournament, open to all countries not in the top seven teams (excluding Korea) at this year's Worlds in Prague, will be held as last year, at the Kisakallio Institute in Lohja, Finland from 29th October to 5th November 2011. Canada are not known as fast starters at international competitions, and faced a tough opening day against China and USA. China had to qualify through the challenge round last November, but impressed observers with their accurate up-weight hitting, much as Korea had done when they came from nowhere to claim silver in 2008. China took 1 with hammer, then stole 2 only to give momentum back to Canada who stole 1 just before the break. 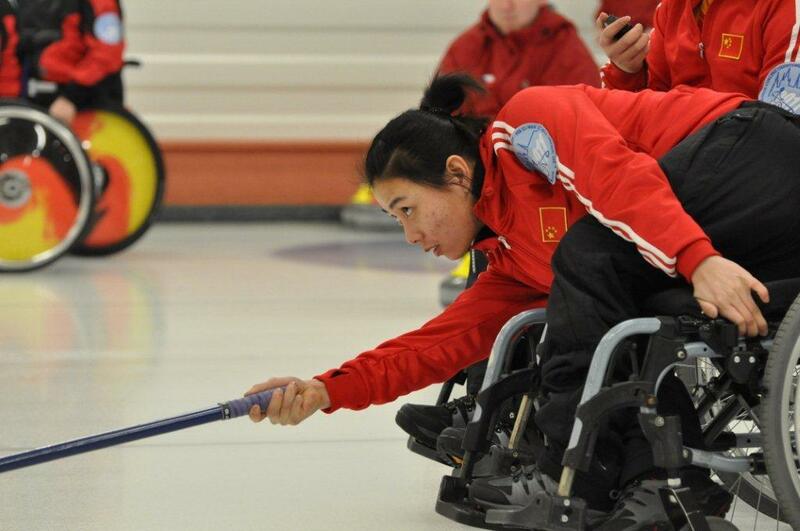 China added to their lead however, with singles in 5 and a steal of 1 in 6 to go ahead 5-2 with two ends remaining. Canada were held to one in the 7th but then came through with a big steal of two in the 8th to force an extra end, winning 6-5 with another steal when China's skip Haitao Wang’s final stone was too heavy. Canada rode their good fortune into their afternoon draw against USA. This time Canada started well, following a blank first end with a 3 with hammer. An exchange of singles left USA down 5-3 in the 8th and though they stole the last point, it wasn't enough, Canada winning 5-4 to join Norway at the top of the standings. Norway saw off regional rivals Sweden 8-3 in seven ends in the afternoon draw, stealing 2 in the 6th and 3 in the 7th before handshakes. In the other morning matches, Sweden went out to a 5-0 lead against hosts Czech Republic but saw it whittled away with a succession of single point steals. Sweden needed their single with hammer in the final end for their 6-4 win. 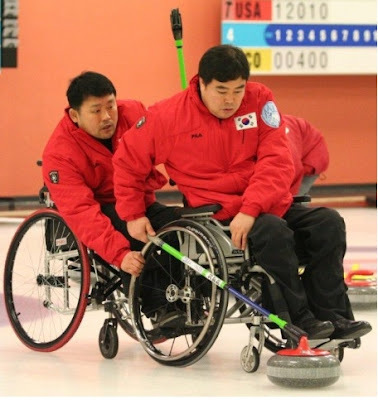 Korea posted 3's in the 2nd and 7th ends but needed a stolen single in the final end to complete their 7-5 win over Germany. Scotland had a bye in the morning and dug themselves a big hole in their afternoon game against qualifiers Russia, falling behind 4-0 after 3 ends. Russia won 7-3, their skip Marat Romanov joking afterwards that traditionally they have lost their first game so to win was a bit of a surprise. The loss against a team they would have expected to beat will not have done much to help the Scots team's confidence after a series of international setbacks. China demonstrated they are the new Asian team to watch in their 9-3 win over a Korean team lacking international experience. The day's results have Canada and Norway at the top of the table while USA Scotland, Czech Republic and Germany await their first win. Canada play just one game tomorrow, against Korea in the morning. You can see results and tables in our Worlds 2011 section of the wheelchaircurling.com website. 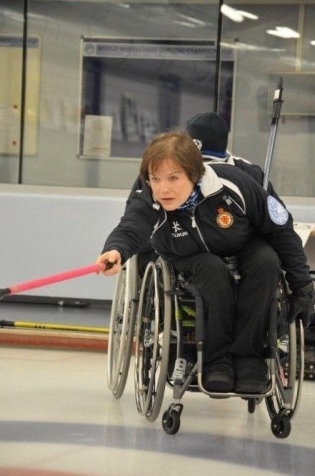 Aileen Neilson, a 39 year old primary school teacher is set to become the first woman to skip her national side at a World Championship when she leads Scotland against Russia Tuesday afternoon in Prague. “Last year, I was used to throwing the last stone for the team, but now I’m skip I’m having to make all the big decisions as well for the team, so there’s a bit of pressure that comes with the role," she told Paul Thomson of the East Kilbride News. “But, hopefully, I can use all the skills and knowledge I’ve gained over the last year to our advantage. “We want to be at the business end of the tournament so as long as we qualify for the semi-finals we won’t be too disheartened. “But we want a place on the podium – that is our goal for this championship." 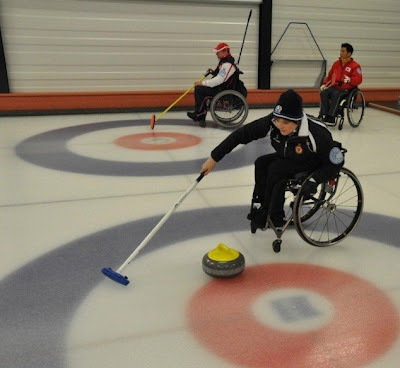 The team competed in an international spiel in Lanarkshire in January, losing to Canada in the final, and were in Perth for some training, game practice and team bonding last week. I would like to express my thanks to Jochen Merkt and the members of Team Germany for their generous donation in support of the website and blog. Weekly Poll #7 - Who'll make the podium in Prague? 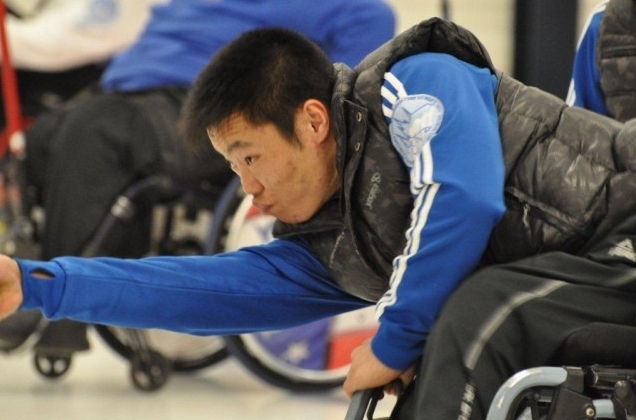 This week we're asking who you think will make the podium at the 7th World Wheelchair Curling Championships in Prague starting next Tuesday, February 22. If you would like to share your prediction of the order the top three teams will finish, add your informed opinion, or wild guess, to the comments below. No guts, no glory. Please remember that comments posted anonymously will disappear without trace, never to be seen again. 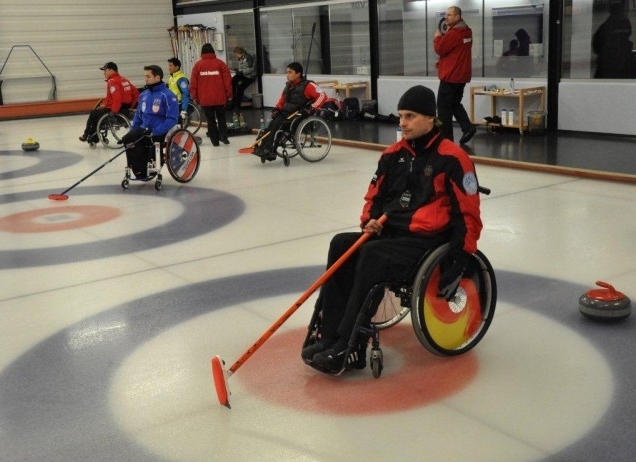 Play at the 2011 World Wheelchair Curling Championships begins next Tuesday, February 22, at the Curling Hall Roztyly, in Prague. Hosts Czech Republic, and the top seven teams from the 2009 Worlds led by defending champions Canada, will be joined by qualifiers China and Russia in a ten team round robin with a page playoff and final a week later on March 1st. 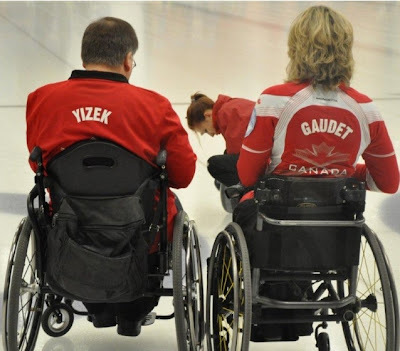 Canada will be heavy favourites having won both Worlds in 2009 and Paralympics in 2010, albeit on home ice. 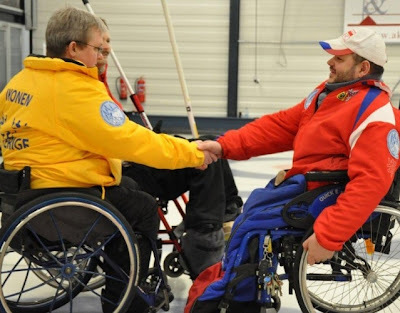 They field their Paralympic team with Alberta's Bruno Yizek at alternate replacing Manitoba's Chris Sobkowicz from an otherwise all British Columbia 2009 World gold medal team. 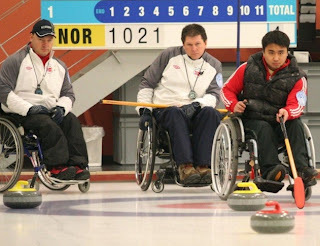 Canada made only a couple of competitive appearances this season; a split squad played each other in the final of the 2010 Richmond International, and the 2011 team went unbeaten in an international spiel in Scotland in January. The one cloud might be how recent legal distractions may have interrupted skip Jim Armstrong's mental preparation, and indeed may have been a distraction to what has been a very close-knit group. 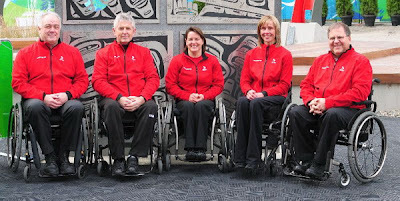 But this is a team that has worked together for over two years now, like each other and have good team dynamics, overseen by sports psychologist Dr. Laura Farres who with Coach Joe Rea and Team Leader Wendy Morgan will be with the team in Prague. In the past Canada has not always got off to a fast start, and in Prague they have a tough opening three games against China, USA and Korea just three days after arriving in Europe. Korea were the team that had all the international coaches worried when they brought an outstanding hitting game to challenge Norway in the 2008 Worlds final. A disappointing 2009 Worlds was followed by a heroic comeback against Canada in the Paralympic final, when they spotted Canada to an 8-1 half-time lead and fell just one short in an 8-7 loss. This year's team is completely new and untested against this calibre of opposition. I have been told that Korea sends its club champion to represent their country (can anyone confirm?) which might explain the wholesale change in personnel. It will be a major surprise as well as a testament to the depth of talent in Korea if a rookie squad can compete against the experience of most of the other teams. 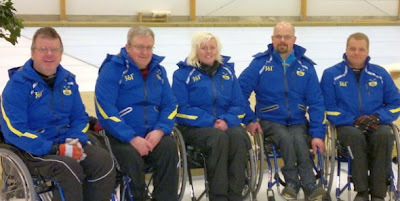 Paralympic bronze medallists Sweden return with their very experienced skip, Jalle Jungnell, now coaching. His Vancouver third, Glenn Ikonen, who ran afoul of the Paralympic drug testers, has served his 6 month suspension and is now skipping. Patrik Burman moves from 2nd to 3rd and last year's alternate, Patrik Kallin who did so well stepping into the team at the tie-break game, plays 2nd. 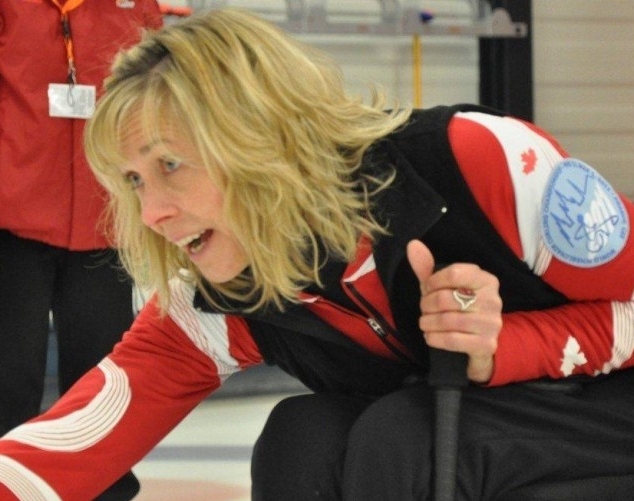 Long-time lead Anette Wilhelm has retired, her place taken by Kristina Ulander who was the alternate in 2008. 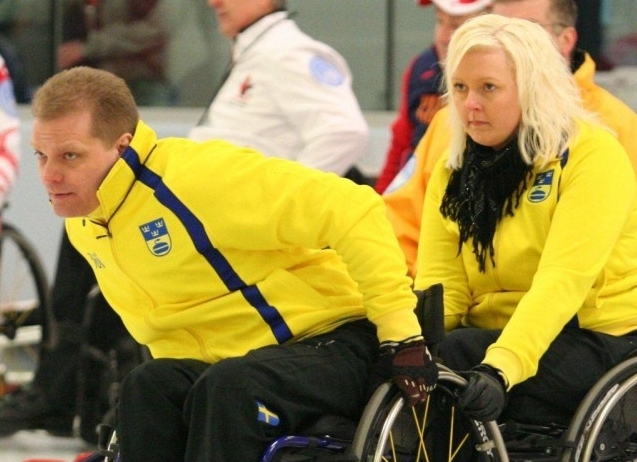 Sweden faced a lot of adversity last year in Vancouver. Skip Jungnell had barely played since a serious illness. They lost their 3rd, who had taken over last stones. But they could rely on the presence and experience of one of Sweden's most decorated players, Tomas Nordin, to see them through tough times. This year their success may depend on Jalle Jungnell's ability not only to come up with a winning game plan, but to lead from off the ice. One group not lacking in confidence is the ever-positive Team USA. They suffered a blow when they lost the services of Patrick McDonald to shoulder surgery. McDonald, a veteran, brought a steely-eyed seriousness to a group not short of things to say. He is replaced by Penny Greely, but the core of the team remain players who have reached the playoffs every year since 2008. With skip Augusto Perez maturing and not trying to win the game with every shot, and some solid support from James Pierce, Jimmy Joseph and lead Jacqui Kapinowski, this may be USA's year to improve on their solitary bronze medal. "I have a good feeling," says Norway's coach Thoralf Hognestad, who had taken his national team to two World titles before handing over to Danish coach Per Christensen for the Paralympics. He is back with Rune Lorentsen at skip and Jostein Stordahl at 3rd, but with a brand new front end. 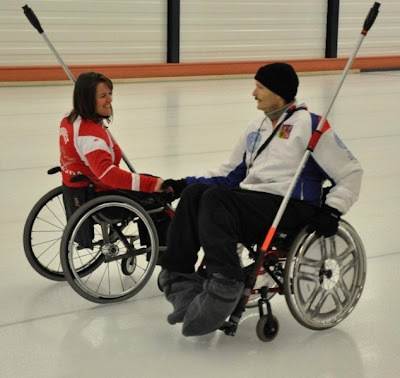 Tone Edvarsen, the first player to take advantage of the WCF rule change that allows power wheelchairs onto the ice, plays 2nd and Terge Rafdal is the lead. Norway have been proof that results don't rely on good statistics. When they were winning they were never atop the stat charts, though it could be argued that their results in Vancouver in 2009 and 2010 were in line with the overall shooting percentages. Norway had an impressive run of 17 unbeaten games earlier this season, culminating in a win at the Prague Open. 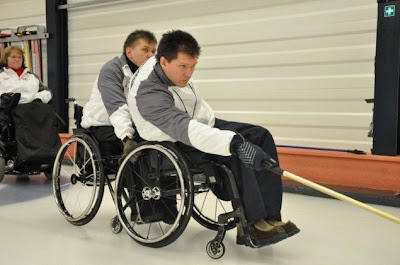 If Rune has his confidence back and Thoralf has them implement his famous "wheelchair curling not regular curling" game plan, they may well make a come back, despite their inexperienced front end. Scotland have made their first major changes since Frank Duffy retired after Torino. Skip Michael McCreadie has taken a year off from the national team while he decides whether he wants to compete internationally again. I think it would be fair to say that while he was an excellent 3rd to Duffy, he never looked comfortable at skip. 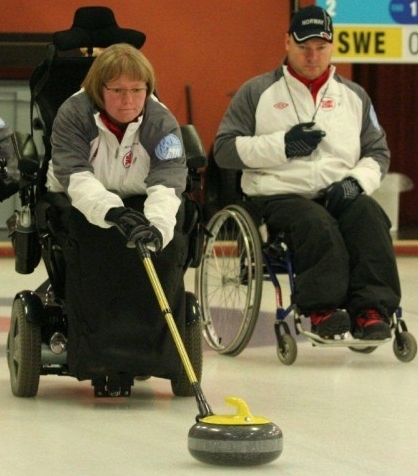 That role now passes to Aileen Nielsen who will be the first female to skip a national side at a World event, though she threw 4th stones at the Vancouver Paralympics. She is supported by two veterans, Angie Malone back at lead after serious illness, and Tom Killin who will be a very experienced vice. The two newcomers are Gregor Ewan, who somewhat rashly told a reporter he was after Aileen's job, and Michael McKenzie, who played under Ewan on the current British Championship team. 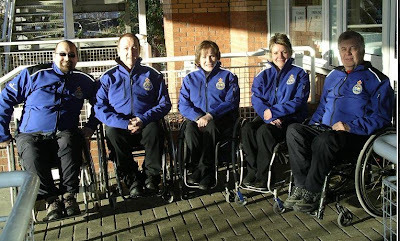 Scotland, who compete as Great Britain at the Paralympics, are a puzzle: highly experienced, well funded and trained, yet with little to show for the resources poured into the program since a bronze medal in 2007. On paper they look a strong side, but a 10-17 performance over the past three years indicates something is missing. 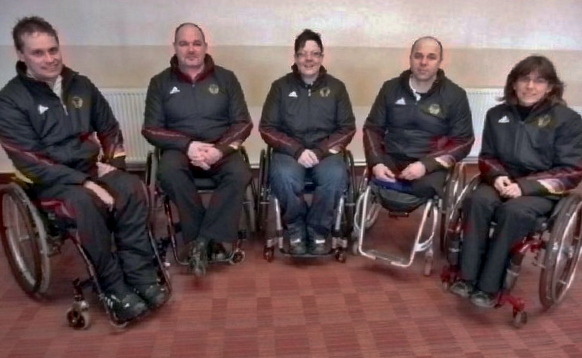 New British national coach Tony Zummack has been unable to take up his position because of paperwork delays in Scotland, so the team will be led by Sheila Swan, who assisted their previous coach Tom Pendreigh. On the plus side she knows the team. On the negative side, the team did not thrive under Pendreigh and his delivery position theories. It remains to be seen who will make the team and where they will throw from. Those decisions will be made by Swan. Zummack hopes to be with the team in time for the Scottish Championships later in March. 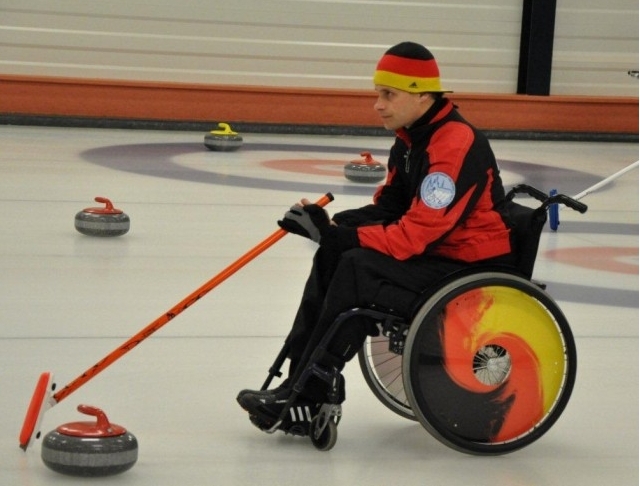 Germany ditched their ebullient skip Jens Jäger after the Paralympics where they fell from a 2009 bronze medal to a tied for last 3-6 record in 2010 with virtually the same team. Marcus Sieger steps up to skip though he will continue to throw 3rd stones. Jens Gäbel throws last rocks, newcomer Stefan Deuschl plays 2nd while Christiane Steger returns at lead. Last year Coach Helmar Erlewein said they would treat Canada as just another game, and not treat them differently from other teams. "We have a master plan," he said, "which we can vary if required." This year he tells me that "because of personnel changes, the team is working on a new tactical concept." In 2009 Germany had a magical round robin that put them into the 1 vs 2 playoff game. Whether this year's team without Jäger will channel the magic of the last rock of the bronze medal game in 2009, or the disappointment of 2010, will depend on whether their new tactical approach works. 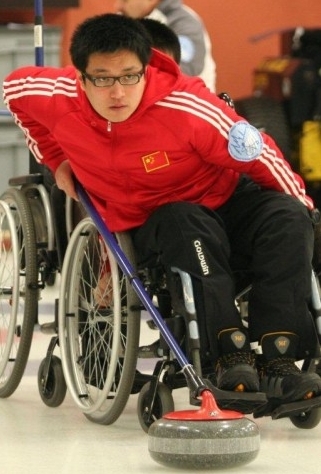 China opened many eyes at the World Qualifying Tournament in Finland by their low to the ice delivery and super heavy hitting. They were the tough luck team in 2009, displaced from automatic qualification this year by the host team. It did, however, give China an opportunity to gain international experience by playing nine games in Finland. 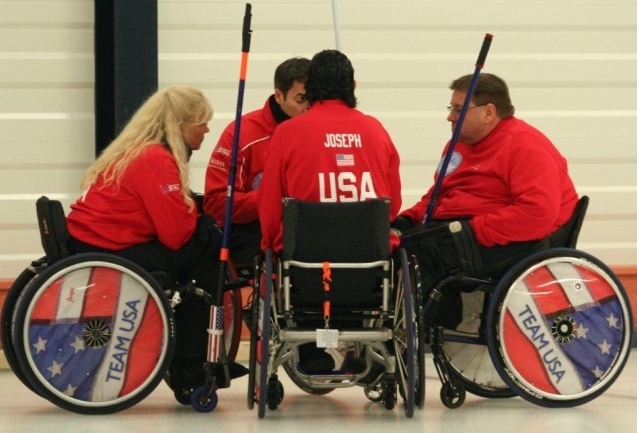 Their team includes three of the players who soundly beat Canada during round robin play at the 2009 Worlds, and if their tactical approach can come close to their hitting, they will contend for a playoff spot. 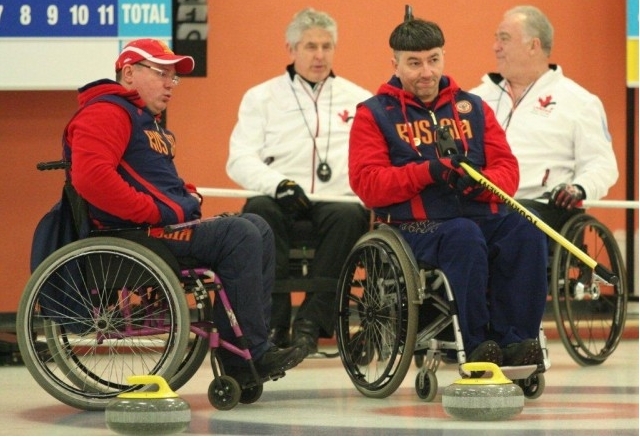 Russia were the last team to qualify for the event, having to beat two 2010 Paralympic teams, Japan and Italy, in the Qualifying playoffs to book their spot in Prague. With the 2014 Paralympics to be held in Sochi, they are the only team competing in Prague who will not need the qualifying points to be amassed over the next three World Championships in order to compete in 2014. Finally, the host team Czech Republic are a team on the periphery of international competition. They have competed in the last three Qualifying tournaments prior to 2010 when they did not need to qualify as hosts in 2011. Their best result was a thrid place finish in 2008 on home ice with the same team that will compete this year. In fact the only changes to the team membership since 2006 has been at lead, currently Michaela Charvátová. Team Czech Republic, this year skipped by Radek Pokorný, with Martin Tluk at 3rd and Radek Musílek listed at 2nd will do well despite playing on home ice, if they avoid the 2011 Qualifying tournament next November.